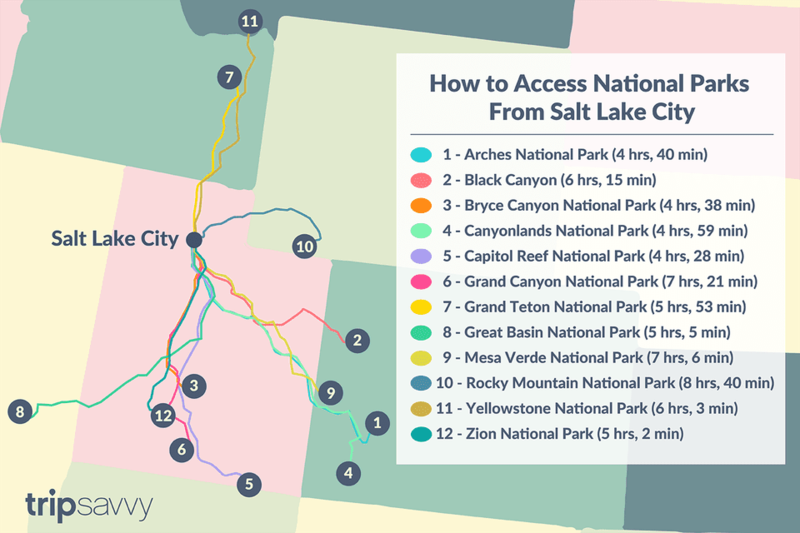 Salt Lake City is surrounded by some of the country's most iconic parks. In just a short time, you can travel from a busy city to a deserted canyon deep in the earth's crust. See how long it will take for your next getaway now! This 27,705-acre Colorado park draws fewer than 180,000 visitors per year, making it one of the ​least-visited national parks in the U.S. national park system. No other canyon in North America combines the narrow opening, sheer walls, and startling depths visible here. No other national park showcases what natural erosion can build than Bryce Canyon National Park. Giant sandstone creations, known as hoodoos, attract more than one million visitors annually. Many take to the trails choosing hiking and horseback riding to get an up-close-and-personal look at stunning fluted walls and sculptured pinnacles. With the magnificent Teton Range as a backdrop, this park is one of the most uniquely beautiful spots in the United States. Towering more than a mile above the valley known as Jackson Hole, the Grand Teton rises to 13,770 feet above sea level. This 77,180-acre Nevada park draws only about 80,000 visitors a year, making it one of the least visited of the US national parks. Among its natural features are streams, lakes, abundant wildlife, a variety of forest types including groves of ancient bristlecone pines, and numerous limestone caverns, including Lehman Caves. Mesa Verde, Spanish for "green table," offers a unique opportunity to see and experience 700 years of history. From approximately A.D. 600 through A.D. 1300 people lived and flourished in communities throughout the area. Peaks towering more than 14,000 feet shadow wildlife, wildflowers, lakes, and forests in these 415 square miles of the Rockies. This park is most well known for its large animals, particularly elk and bighorn sheep, but also offers opportunities to view a variety of other wildlife as well. Located in Utah's high plateau county, the Virgin River has carved a gorge so deep that sunlight rarely reaches the bottom! The canyon is wide and completely stunning with sheer cliffs dropping some 3,000 feet. Weathered sandstone shines red and white, and creates amazing sculptured rocks, cliffs, peaks, and hanging valleys.